I have always loved mythology, especially Norse mythology. When Neil Gaiman came out last year with Norse Mythology I put it on my list to sometime read it. But since I thought one could not come up with more new. I give Norse Mythology by Neil Gaiman five out of five hearts because it is a great and fun read. Neil is a great author so I didn’t expect anything bad, but he out did himself. 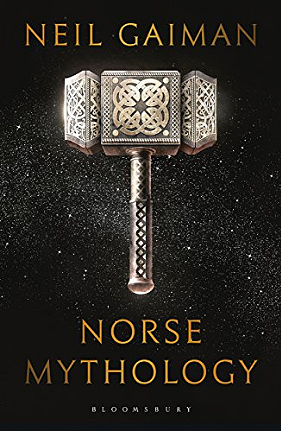 I worried Neil would write his own stories within the Norse Mythology for this novel (I didn’t read the synopsis before reading the actual novel) and thought it would be a three or four hearts read. Neil is a great author and him coming up with something good wasn’t far fetched. But he actually rewrote a lot of the well known mythology. The stories are (mostly) all about the same characters, Loki, Odin and Thor. I actually didn’t know there were so many stories centered around these guys. Of course there is a whole pantheon of gods that shuffles through too, but like Neil writes in his Foreword, most stories actually center around these three characters. All three have their distinct personalities and already for their behaviour you know which is which character. Overall I think Norse Mythology is a great read. Neil’s writing is funny and fast paced. He goes from one little story into the next and they flow into each other. This entry was posted in Book Review and tagged Book Review, Fantasy, Mythology, Neil Gaiman. Bookmark the permalink.